PokerStars are opening their wallets again to gain more and more exposure. Now its time for a sponsorship in the French Football League – Olympique Lyonnais. The french football team was previously sponsored by BetClic, a well known french poker site and sports book, however hence that they did not choose to re-new their sponsorship it came an opening for PokerStars who run their poker site on PokerStars.fr. PokerStars efforts of branding already took place in the last home game for Olympique Lyonnais versus Evian Thonon Gaillard, where as PokerStars had running video commercials on the arena. 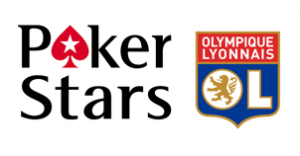 Thanks to the sponsorship fans of Olympique Lyonnais will also be able to play PokerStars new series of poker tournaments where you can win team articles from the team as well as tickets to their home games. Once again we learn that PokerStars are continuously being aggressive in their attempt to take larger market shares towards the other online poker sites.